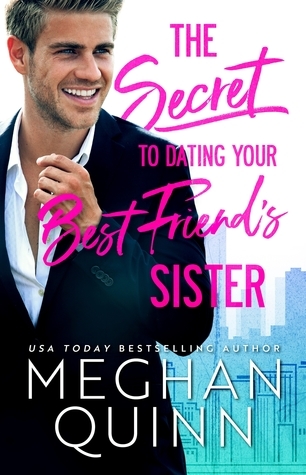 Review – The Secret to Dating Your Best Friend’s Sister by Meghan Quinn. Another cute, hilarious, swoony rom com. Bram thought he had it all down in wooing his friend’s sister Julia – pretends to set her up with men, goes on dates with random women, and show up at her apartment unannounced to confess his love… sounds good? Unfortunately, his plan got back fire. Julia is witty, smart, and she isn’t buying what he is selling … Bram needs to work a little harder and boy, he did. I love Bram – new book boyfriend alert!!! Bram is super charming, adorable, swoony. He is sweet, funny, understanding … really all the qualities a girl could dreamed of. Julia is a hard nut to crack though. She has her insecurities and she doesn’t want to be fooled by anyone which make it a little harder for Bram to win her over. Will his charm and persistent finally win Julia’s heart? If you are looking for a little angsty, forbidden, charming, and passionate romance this book is for you. You really can’t go wrong with one of Meghan book – hilarious banters, flirty, fast paced, adorable characters, and of course with a HEA ending. Beautifully written. Fantastic read! ✓ Romantic Comedy that will melt your heart. Need a weekend read? You do not want to miss this story!! Cover reveal: RIVER WILD by Samantha Towle. Gorgeous Cover – When August Ends by Penelope Ward is coming Feb!